Usually when a reporter wants to spin against the NRA and its millions of grassroots members, it’s a lot more subtle than outright fabrication of things that did not happen where cameras and thousands of people are present. I mean, let’s face it, that’s just bold to think you won’t get caught in that kind of lie. However, that’s what Louisville Business First‘s Baylee Pulliam tried to pull off in her Twitter coverage of the NRA Annual Meeting. 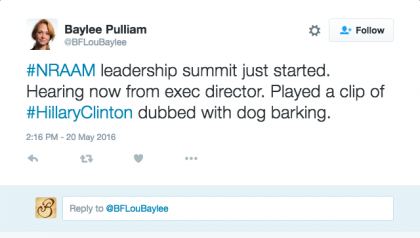 Pulliam tried to claim that NRA was dubbing dog noises over video of Hillary. Except they didn’t. It’s a complete lie that NRA dubbed barking noises over Hillary. NRA simply played the video of Hillary herself barking like a dog. Even though I was in the law seminar during the political event, I checked with multiple people there, and I watched the video which NRA News helpfully streams live and posts after the event. But don’t let that stop the narrative that must be told that NRA and its members hate women. No, Pulliam needs to help push a narrative, so false accusations of dubbing must fly around social media. Since at least one person has called her out, Pulliam tried to delete her tweet. But was there any kind of correction or apology posted? Nope. Acknowledging such an accusation means it gets documented that the reporter doesn’t actually keep up with current events and somehow missed the news of Hillary barking, doesn’t do research before throwing out claims against innocent organizations, or she really is simply willing to unfairly accuse NRA of actions they did not take until someone publicly calls her out. With more than 20,000 videos on YouTube and nearly 500,000 Google links when searching “Hillary Clinton barking,” I find it doubtful that someone covering political events would miss that kind of news. It’s certainly possible that she just throws out accusations and doesn’t do research before doing so, but that seems a little reckless for a reporter at a business-focused media outlet. Sadly, that leaves the third option as a very real possibility. Possible. Reporters are not only biased. They are lazy, stupid, and ignorant as well. This youtube of a segment of the CNN Don Lemon program, demonstrates the amazing arrogance and ignorance of the press on gun issues. And the anger it arouses feels like the fire of a 1,000 suns.